The Trade Sanctions Reform and Export Enhancement Act of 2000 liberalized the export policy of the United States with regard to the shipment of food and medical commodities to Cuba. As with any changes in trade policy, an important question is the estimation of the resulting economic impact of governmental action. Such an economic impact study titled “Economic Impacts of U.S. Agricultural Exports to Cuba” was conducted by Parr Rosson and Flynn Adcock in 2001 at the Center for North American Studies at Texas A&M University. They measured the change in economic activity at a state level using an input-output model. This study’s data and methodology will serve as the basis for a general equilibrium analysis of the reduction in trade restriction with Cuba. An input-output model represents the interrelationships between industrial sectors in an economy in terms of the sector’s purchases of intermediate goods and services from and sales to each other. These purchases of inputs to the production process by industries include the acquisition of labor from the household sector. The input-output model includes final demand purchases of the produced output. The model can be used to predict the total impact to the economy from changes in final demand. Exports are a component of final demand and the Rosson and Adcock study postulates three alternative levels of growth in exports to Cuba: low, moderate, and high expansion in agricultural trade. The trade scenarios and state shares of exports were based on forecasts and production statistics compiled from various government and industry studies. They estimated the economic impacts for 22 commodity types in 50 states. Cuban agricultural imports include fertilizer, insecticides, grains and grain products, wheat, rice, oilseed, beans, protein meal, vegetable oil, poultry meat, processed foods and forest products. The IMPLAN input-output (IO) modeling software has been used here to estimate the economic impacts of increased trade with Cuba. It includes the inter-industry commodity flows, purchases of imports, value added, and sales to final demand consumers for those U.S. states that trade with Cuba. The export sector of final demand drives the model. Purchases for final use instigate a multiplier process as producing industries purchase goods and services from other industries which one after another purchase from other industries. The increased income from the sale of factors of production also contributes to the overall state impact. An input-output representation of the economy focuses exclusively on the demand side of the market systems. It assumes that prices are fixed and that the production technology is described by fixed proportioned inputs. Thus, the model neither incorporates substitution between inputs nor does it acknowledge any supply or capacity constraints. However, the basic framework of the input-output model can be integrated into a more comprehensive representation of the economy called a social accounting matrix (SAM). Besides the IO interindustry linkages, a SAM accounts for all the transactions in the economy. There are certain transactions that do not involve the exchange of goods and services for money such as tax payments and receipts of transfers. A SAM is balanced in the sense that income (rows) equals expenditures (columns). A SAM is the foundation upon which a general equilibrium model is built. A SAM for the state of Florida is presented in Appendix A. The table at the first column section is equivalent to the transaction matrix of an input-output model and is called the use matrix. The next matrix below the use matrix represents the factor inputs into the production process and below it are the tax receipts paid to the government sector. This particular formulation of the SAM is import laden, which means that imports are combined with domestic use. Since the export sector is the focus of this study, such a formulation simplifies the equations of the model. At the top of the next column section is the make matrix, which represents the production of the industrial sectors. In IMPLAN, the institutions, households, government, enterprises (businesses), investment (capital), and inventory, also produce output. All institutional output except government has been included in the final demand matrix. The third column section shows the distribution of factor income to institutions and the net import of factors. The fourth column section contains the final demand matrix and the inter-institutional transfers. The last column section is the export of the industry sectors, factors, and institutions. General equilibrium analysis is an established method for the evaluation of the efficiency and equity of public policy options. Its use of actual economic data and ability to describe the various interrelationships and interactions between a variety of markets, sectors, and economic agents make it the best tool for examining the primary and subsequent responses to a change in policy. Partial equilibrium analysis corresponds to a single market. A partial equilibrium model examines the effect that one variable has on another variable by employing the ceteris paribus (all other things equal) assumption. A general equilibrium model includes multiple markets and sectors with expanded possibilities for actions and reactions. Feedback and spillover effects between different markets and sectors of the economy can also be explored. The equilibrium model is composed of market exchanges and transactions between economic agents such as institutions as households, firms, government, capital, and the foreign sectors. Each product and factor market is characterized by a demand equation, a supply equation, and a market clearing condition such that prices adjust to equilibrate the demand for each commodity or factor with its supply. Another way of saying this it that excess demand is zero. Each agent is defined by an income and expenditure equation or macro closure condition. The household income definition states that income equals factor price times labor and capital endowments plus interinstitutional transfers. The income equation for the firms in a constant-return-to-scale production technology takes the form of a zero profit condition where the value of output is exhausted by the cost of production. Households and firms display constrained optimizing behavior from which the product and factor market supply and demand functions are derived. The income definition of government states that revenue is equal to expenditures plus transfers. The income definition for the capital sector states that savings is equal to investment expenditures. The definition for the foreign sector states that imports are equal to exports plus foreign savings (balance of payments). Equilibrium describes the state of the endogenous variables in the model such as prices and quantities to which the agents respond. These prices and quantities in turn determine the income of the economic agents. Public policy for the most part seeks to change the behavior of consumers or producers. The general equilibrium model presents an explanation for the responses that these agents have to alternative policies. It also can account for any consequent reallocation of resource across economic sectors and institutions. The impacts of policies on the welfare of the households and the distribution of income among them can be estimated as a result of this analysis. In the product or commodity market there is a set of equations for each good or service. The household’s demand equations are derived from their maximization of a Cobb-Douglas utility function constrained by their income. where C stands for consumption, p for prices, r for return to capital, w for wages, L for labor, K for capital, Y for output, A for the Leontief technical coefficient matrix, X for intermediate goods, G for government, I for investment, E for exports, and M for imports. The firm’s supply of commodities and demand for inputs are the result of a two step process. First, the conditional demand functions for capital and labor are chosen by minimizing the firm’s total cost subject to a Cobb-Douglas production function. The supply of factors of production is exogenous. Next a firm selects the optimal level of output by maximizing profit or the difference between total revenue and costs. In a constant return to scale production technology the supply equation takes the form of a cost of production function. intermediate demand plus final demand. Y = C + X + G + I + E.
The firm’s income definition states that the value of production sold on the domestic and foreign markets equals the value of intermediate commodities plus the value of capital and labor used in production, which are essentially the first row and column of the SAM matrix. The production function has a valueadded component and a Leontief input-output matrix. The Leontief input-output matrix represents the interindustry flows of goods and services used in the production process. The economic agent comprising the investment sector is specified by an investment demand equation that is derived from maximizing a Cobb-Douglas utility function subject a savings constraint. The saving constraint stipulates that investment expenditures equals total savings. The household sector includes a saving equation where saving is equal to the marginal propensity to save times income. Household consumption is income minus savings and final demand includes investment. Government savings is exogenous and foreign saving equilibrates the balance of payments. The government sector as an economic agent in a general equilibrium model is made up of a tax revenue equation and a government expenditure equation. The expenditure equation includes transfers and government consumption demand for public goods and services. Government consumption demand is derived from maximizing a Cobb-Douglas utility function subject a budget constraint. The budget constrain is equal to tax revenue minus transfers and government savings. Final demand includes government expenditures and the model’s income definitions incorporate taxes and transfers. The foreign sector introduces exports and imports into the model. Domestic production is supplied either to the home market or it is exported to the foreign market. A firm maximizes its revenue from selling on the domestic or foreign markets subject to a constant elasticity of transformation function. The solution to this maximization problem results in equations for domestic supply (YD) and exports. Domestic demand is usually modeled using an Armington assumption. A firm produces a composite commodity from domestic supply and imports by minimizing its costs subject to a constant elasticity of substitution function. The solution to this minimization problem results in equations for domestic demand and imports. As mentioned earlier the import laden SAM includes imports in the domestic final demand matrix. There is an income definition for domestic production and for domestic demand in the form of a zero profit condition. The former income definition states that the value of domestic production is equal to the value of exports plus the value of domestic supply. The later definition states that the value of the composite commodity is equal to the value of imports plus the value of domestic demand. The regional economy is modeled as a small county which has no influence on the exogenous prices of exports and imports. The import and export price are expressed as the world price times the exchange rate. The balance of payments is defined as the value of imports equal to the value of exports plus foreign savings. Any surplus or deficit between the level of imports and exports is balanced by the foreign savings. The model’s equilibrium solution is specified by the values of its endogenous variables. Initially the parameters of the model need to be calibrated. The calibration process move backward from the SAM to construct the model given the functional forms of its equations. The social accounting matrix which describes all of the transactions between economic agents underlies the general equilibrium model. The transaction of the economic agents in the model should replicate the observed data. The general equilibrium model can be used for a comparative static simulation of a policy change by altering policy variables or introducing exogenous shock. A new counterfactual equilibrium solution is calculated with new set of prices and quantities. The new prices determine an alternative set of factor demands, output and income values. These values are then compared with benchmark equilibrium values. The benefit of the policy decision in terms of consumer welfare can be determined using an income based index (equivalent and compensating variation) which measures the amount of income the consumer would need to achieve a specific level of utility or welfare. Because a general equilibrium model is based on the consumers’ maximization of utility, the welfare index can be calculated. By using the Rosson and Adcock study as the starting point for a comparative static simulation of an increase in trade with Cuba, one can take advantage of the fact that the IMPLAN software produces a SAM for the construction of a general equilibrium model. 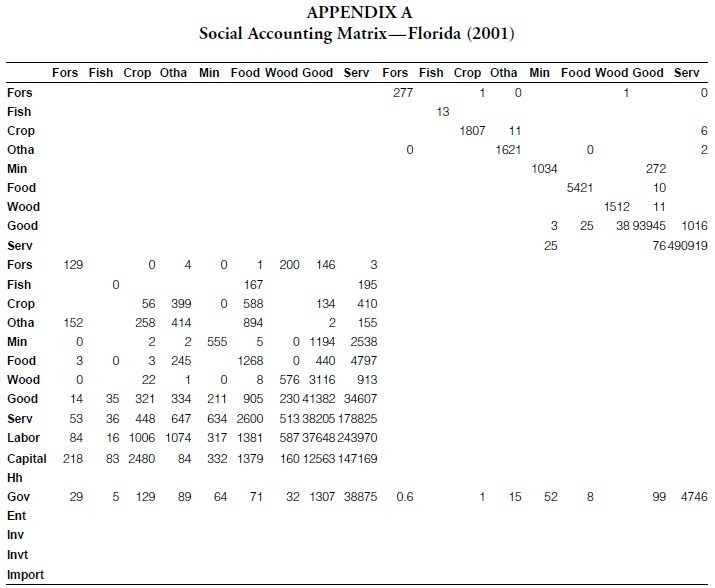 The IMPLAN codes used in the original study were aggregated into the major industry sectors: forestry, commercial fishing, crop production, mining, food processing, wood products, other agriculture, goods production, and services. The first six sectors were directly impacted by the reduction in trade restriction. The Rosson and Adcock estimation of the increase in exports is displayed in Table 1. Total sector output is displayed in Table 2. Since the original study’s estimations of stepped-up exports are insignificant for simulation purposes, it is assumed that the directly impacted industries initially increase totally by one percent and individually by their proportion of the total (see Table 3). 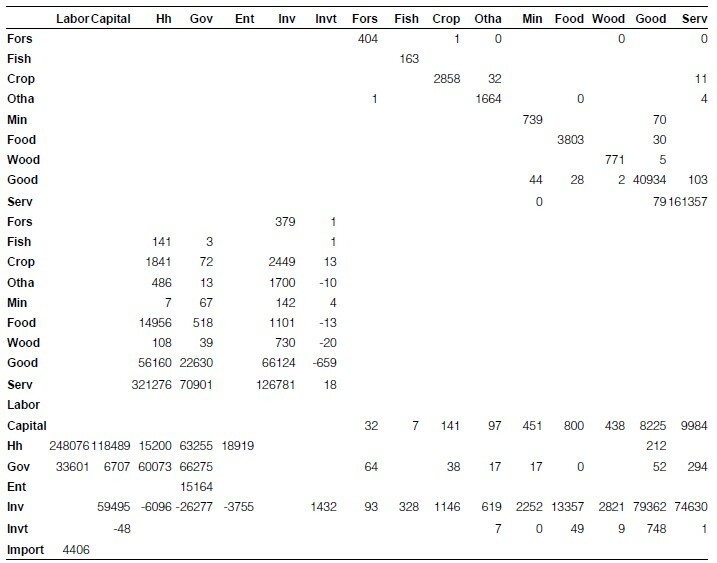 The counterfactual solution of the general equilibrium model results in a zero impact for all variables except the following: forestry, fishing, crop production, mining, food production, wood production, investment, savings and foreign investment (see Tables 4 and 5). The absolute decrease in the domestic production and consumption of commodities is greater that the increase in exports. This difference results from a decline in investment spending as resources are transferred to expand exports production. There is no change in the household or government final demand. The measures of welfare on the State of Florida are effectively zero from the change in trade policy. It seems that the lack of an economic impact is due to the slight increase in agricultural exports attributed to additional trade with Cuba and to the fact that the impacted industry sectors make up a small fraction of the overall industrial output of the State of Florida. Thus, argument for or against trade liberalization with Cuba should be based on reasons other than economic gains or losses.